So, it fell to the SYSTEM-1 – a neon-green, slim-line keyboard synth – to make PLUG-OUT the big draw. You know, like “plug-in,” but … uh … out. The notion is this: load software models onto your computer, then copy that same model to the SYSTEM-1 hardware. While the keyboard is physically connected to your computer, the software makes it easier to integrate with your host. Disconnect, and you can still use the keyboard standalone. Today, we finally get to learn just what that’s like in practice. And we get to hear what Roland’s recreation of their legendary SH-101 synth sounds like. This isn’t a full review of the SYSTEM-1 – that’s coming next week. But we get a first look at this banner feature. Straight from the factory, the SYSTEM-1 has its own two-oscillator synth, one that matches perfectly with the controls on the unit. And it has a PLUG-OUT button that doesn’t do anything. To try PLUG-OUT, and to be able to switch between the SYSTEM-1’s default personality and its new alternative personality, you’ll need to update. That means installing the 1.10 update for the keyboard’s firmware, an easy process of just takes a couple of minutes. And it means installing the plug-in software. There’s a coupon in the box with a URL – yes, really roland.cm, not roland.com. You have to register for an account, which you can do by entering some basic personal information manually or using your Facebook login to do the same. And you download about 90M of plug-in software for your OS. Enter a product key, and the software automatically authorizes itself the first time you run. About that plug-in: this really is a conventional plug-in, for VST (OS X/Windows) and AU (OS X) – no RTAS, Pro Tools users. It doesn’t require your SYSTEM-1 to be connected as some sort of dongle. 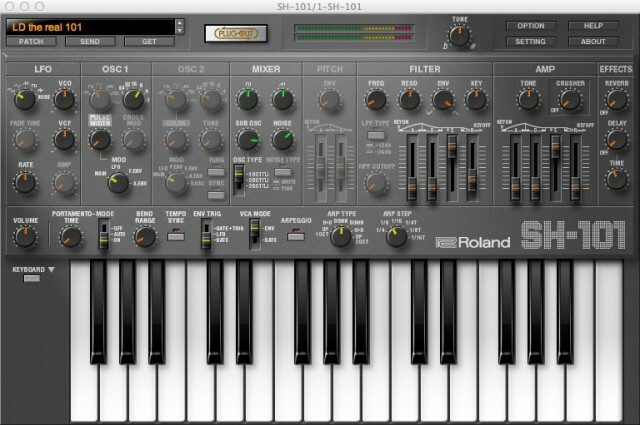 Without your keyboard plugged in, it’s a bit like Roland’s take on KORG’s Legacy Series – a software model, running on your computer, that emulates a classic from the past. And you get a software interface that looks like an SH-101. You can even change the color. Otherwise, this is a conventional plug-in, but that also means tasks like recording automation data are a breeze. Oh, and importantly – it sounds really, really good. I’ll make some more sounds before the final review, but here’s a first play. Note that I’m adding the SYSTEM-1’s rather nice delay and reverb effects. It’s tough to tell from a sound demo, but the component modeling is such that the instrument really responds the way you’d want a vintage instrument to respond. It breathes. Now, there are some great SH-101 plug-ins on the market, and because Roland has stuck rigorously to the functionality of the original, the SH-101 plug-in doesn’t have any extra features. 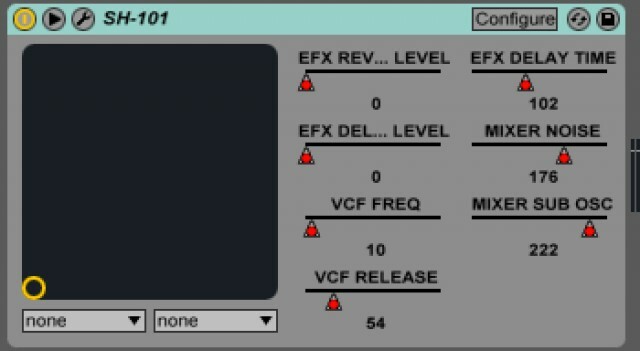 So, at this point, you really wouldn’t want this plug-in just to use as a plug-in. You’d want this or this. They sound I think about as good (each with a distinct character, since we’re modeling analog gear here), they look better, and they do more. But that’s before you’ve connected your keyboard, which is where things get interesting. Connect your SYSTEM-1, and the plug-in is instantly controllable via the knobs, buttons, and faders on your keyboard – every single parameter. The SYSTEM-1 actually has too many controls for an SH-101, so those electric-green lights you’ve been watching now have a significant feature: they light up to show you which controls are active. And for the most part, even though the SYSTEM-1 is mapped to another, two-oscillator synth, the labels are reasonably logical, though as you first start learning I’d suggest switching the plug-in to its SYSTEM-1 layout and keeping one eye on the screen. Having this sort of pre-mapped, hands-on control is really terrific. It makes it feel as though you’re using hardware, not software, but without having to sacrifice the conveniences of working with your host DAW. It’s also nice to set up the audio input and output to the SYSTEM-1. On a Mac, you might even set up an aggregate device with your main audio interface to keep everything at the ready. From a workflow standpoint, it’s lovely stuff. Load the plug-in. Tweak a bit. 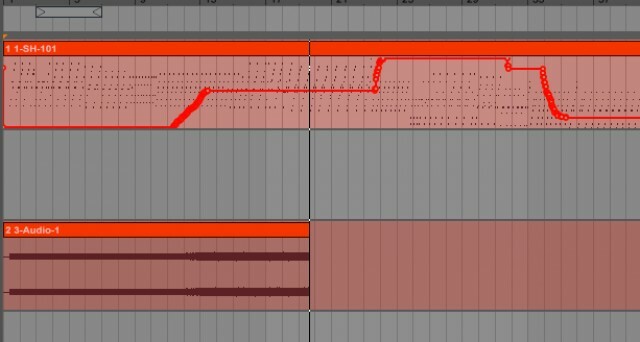 Record a take – now you’ve got MIDI, not only for notes, but all the automation, as you see in my Ableton Live screenshots. You can modify the automation right in the DAW, play it back, record to audio – all using the internal interface. A laptop and a SYSTEM-1 in a backpack are then a really nice studio on the go. Automation data is now saved directly from the plug-in – as you tweak the physical controls on the hardware. It’s a lovely arrangement. These parameters mapped automatically in Ableton Live. Then, when it is time for audio, you have your MIDI/automation ready to go – and can stream sound directly from the SYSTEM-1’s audio in/out interface. Press the big “PLUG-OUT” button on the plug-in, and in about 30 seconds, the software loads the whole model onto your SYSTEM-1 keyboard. It’s not a VST running on your keyboard or something like that; I’m assuming instead it’s code that interacts with the component models in the SYSTEM-1’s onboard hardware. But what’s nice about this arrangement is that you can disconnect your keyboard from your computer and still have the sounds. You can also switch, on the fly, between the SYSTEM-1 and SH-101. 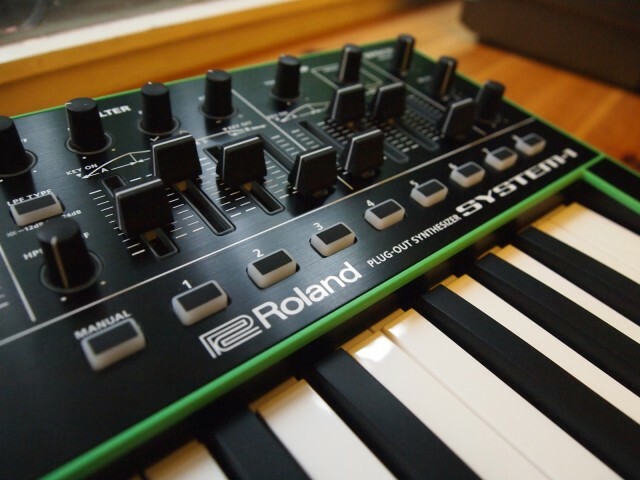 So right out of the gate, buy a SYSTEM-1 synth today and you’re really getting two synths. Up to this point, I’m really sold. I’m content to have a great SH-101 model plus the SYSTEM-1 synth (a very respectable, fun-to-play two oscillator instrument), plus the delay, reverb, arpeggiator, and scatter effects. I’ll talk more about the SYSTEM-1 as a synth next week. It has its oddities: the video-style shuttle wheel stands in for a pitch bend and mod, there’s new velocity on the thin two-octave keyboard, and… well, there’s an awful lot of green. But without spoiling the full review, it’s great fun to play and I’m happy to have it around. The deeper question is whether PLUG-OUT becomes a platform for Roland to release reissues of classic synths. Could a Juno be far behind, for instance? There, I’m a little dubious as to the advantage of PLUG-OUT itself. You can only load one model at a time, manually dumped from the software – rather than just loading a firmware update and having the extra sounds whenever you like. On the other hand, there’s some significant value with just the SH-101, and seeing another vintage instrument appear would be rather nice. And to me, the main plus here is really the software integration. It means the SYSTEM-1 is a great companion to a computer (especially for recording and production), that also happens to work on its own when you want to skip the laptop entirely (for jamming or live use). But it’s well worth looking at this choice, too. See you then. Below: Roland’s video showing the process.